It's Winter here, so what's the good news? Aside from finally raining this winter, unlike the past 11 or so, and not being too cold - yet, my business cards have arrived! Big yay. Very excited. They're actually a stamp. The perfect use for all those skinny lengths of canvas and lovely artist's papers that I end up with after cutting the main piece to size for an artwork. 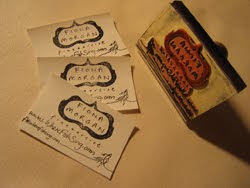 And far more creative, individual, unusual and sustainability minded than any business card from a printers. More promotional business, my first ever press release seemed to do OK. It was listed at PR Log which seems to be a useful free service that gets a LOT of traffic. I scored 214 unique hits (to the press release) in 2 weeks. Not bad for an evening's writing. The bummer is that none of that seemed to be ongoing, unlike telling everyone I know about the project which brings people back to WhereFishSing again and again. The next PR stage is to contact individual high traffic websites (Quantcast is useful here) that are likely to be interested in the cookbook project. Likely due to shared attitudes and interests. I'll let you know next month how this goes. On to the painting - I has acrylic paints! While I love oil paints - the brushfeel, the lustre, the blending- I hate the drying time. Wainting days for a layer to dry is just way too long for some of the styles of painting I am trying out along with the schedule of the cookbook. The 20 or so minutes of acrylics is far more workable. So far so good, though I think they smell terrible. I also have linen canvas, and more of my favourite filbert brushes to play with. The linen is usually hideously expensive. As in over a hundred dollars a metre. However, the wonderful people at Chapman & Bailey also sell their offcuts. These are small pieces but they happen to be the perfect size for the paintings I am doing for the cookbook - 30 x 30cm or 1 foot square. They sold a bunch of offcuts to me for a price similar to regular cotton duck canvas. I am thrilled. I get to try out the ultimate painting fabric before being a sqillionaire. On top of all this goodness, a freelance medical illustration project has come in, which has eased the cashflow situation. Between this and the hours I am doing on the cookbook, my days are long. This is not sustainable long term, but it will only last until the end of July. I suspect my time management is going to be much improved by then, which can only be a good thing. And lastly, I think I might finally have learned to sleep when tired. Flu all around me avoided and more work than usual done. Nanna napping is cool. Pretty similar to last months, but this time, with the addition of getting help. The PR campaign Collective Merrymaking has begun, but time is short for me, so I am seeking help while I'm overloaded to get these things done. I'm a real do it yourself kind of person, so letting some things go to another person is kinda a big deal. But I can do it. Release the fully stocked Official Art Store. Again I need help. It's now ready to roll except all the paintings so far need to be scanned. A big job. So, time to ask for help. Paint, paint, paint! It's taken a while, however I am finally (almost) in the swing of painting every day. At the moment it's 'most days'. Perhaps that needs to be my aim, to take it up a notch and aim to paint *something* every working day. That's a good one, it's much more specific.